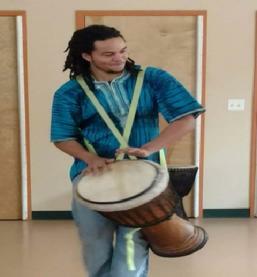 Gabriel began drumming when he was six years old with Sekou O’Huru at Five Star Dance Center in Teaneck, New Jersey. 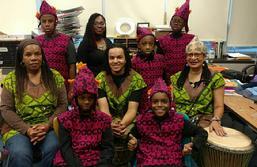 He has since studied under master drummers, Makane Kute, Jerry Dzokoto, and Frank Malloy. Gabriel has already begun passing down the art form as he has taught drumming at day care centers, schools, colleges, and for Chiku Awali. Gabriel joined Chiku Awali in 2004 and has performed numerous times with the company. He traveled to Ghana, West Africa in 2010 and had the privilege of drumming with Jerry Dzokoto and Dza Nyonmo African dance ensemble. He played the Little Drummer Boy at Lincoln Center with Brian Stokes Mitchell and the Philharmonic Orchestra. Gabriel graduated from Spring Valley High School in 2013 and attended Rockland Community College receiving his Associates degree before entering SUNY Purchase where he is a psychology major. © Chiku Awali African Dance, Arts & Culture, Inc. All rights reserved.